From the Beginning to Where We Are Today! Originally called Nickelville, reportedly after the name of the first store, Wylie was organized in the early 1870’s. 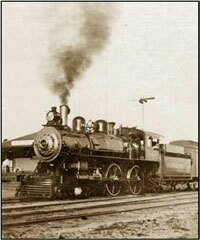 The Gulf, Colorado, and Santa Fe Railway laid tracks a half mile north of the original townsite in 1886. 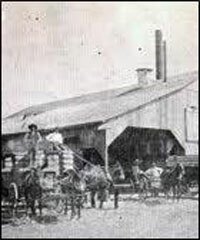 The businesses of Nickleville moved to take advantage of the railroad within the following year, and the City of Wylie was incorporated in 1887 along the right-of-way. It was named for Lt. Colonel William D. Wylie,  a right-of-way agent for the railroad  and Civil War veteran. By 1890, Wylie’s population had increased to 239 and it’s first one-room school was built. From 1890 to 1900, the population increased by 300% and a two-story schoolhouse was built along with the addition of a bank and gin mills. 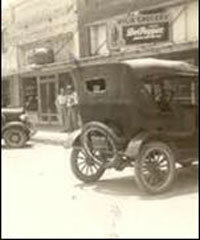 In 1920, Wylie received electrical service and streetlights. Ballard Avenue was graveled in 1923; and Wylie enjoyed the self-proclaimed “Onion Capital of the World” title in the 30’s and 40’s. Due to the late night get-together’s of citizens in which businesses stayed open until midnight on some nights, “Wide Awake Wylie” became the City’s nickname in the late 40’s and 50’s. In the late 70’s, Wylie began to receive some of the DFW growth. It’s population grew significantly specifically in the late 80’s and 90’s. The 90’s also saw two major catastrophes- a tornado hit Wylie on Mothers Day in 1993, and in December 1998, two fires (one on the 9th and another on the 11th) destroyed and/or damaged a dozen or so businesses. The City and citizens turned this catastrophe into an opportunity to revitalize downtown. William Sachse, who came to America from Herford, Prussia in 1840, was the founder of Sachse. He arrived in Texas in 1845, securing 640 acres in Collin County and erected one of the first cotton mills and gins in the county. in 1886, Sachse gave 100 feet of right-of-way frontage through all of his holdings to the railroad. In exchange, the railroad built a depot and named the town Sachse. The first school in Sachse was built by the State of Texas on the corner of Sachse Road and Billingsley Street. The next school, located at Third and Dewitt Streets, was built in the early 1900’s and also served as a place for town meetings and as the local church. During the 1920’s, a new one story red brick school house was built on the same site and remained the school house for Sachse children until the 1930’s when the red brick school house was razed. While a new school house was being built, the children attended school in Garland. The new school building still stands across the street from First Baptist Church of Sachse. In the 1940’s, however, Sachse consolidated with the Garland Independent School District and the children were bused to attend school in Garland. By the late 1920’s, onions were competing with cotton as a major cash crop, and the cotton platform located next to the railroad was converted into an onion shed. At this time, the business district of Sachse included the train depot, two onion sheds, cattle pens, two blacksmith shops, two gins, the Kerley store, two general stores and a bank. With the growing popularity of the automobile came the rapid decline of passenger traffic by train. As a result, the train depot fell into disrepair and was torn down by the railroad. A tornado destroyed the roof of the onion shed west of Third Street and soon both sheds were torn down as well. Follow Housewarmers of Wylie, Sachse & Murphy on Facebook to stay up-to-date with what’s going on in our community! Or get it delivered to your email inbox! View a list of some of the finest restaurants, home service and all-around businesses that Wylie, Sachse & Murphy hava to offer. Welcome to the Community! See where Wylie, Sachse & Murphy have come from and what they have to offer. Do You Have a Business in Wylie, Sachse or Murphy?